Love this app! It’s by far the easiest, most convenient CRM software out there. Love you HCP! So far I am liking the concept but I don’t like that there isn’t a specific iPad app so I have to use the phone app and blow it up so it looks tacky. 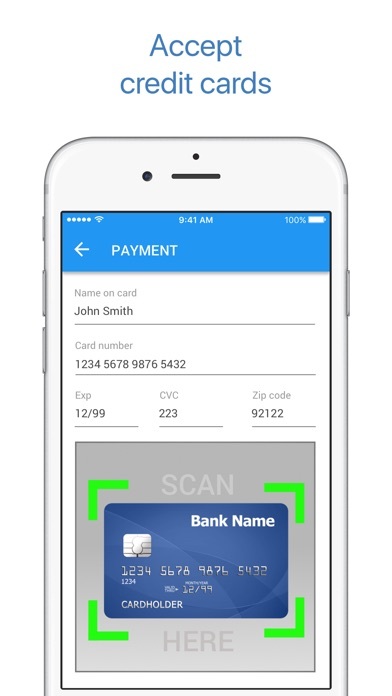 The app works wonderfully other than, the customer data base does not automatically update from invoices created leaving me to believe it is not fully integrated. I assume this can be fixed easily by someone who is far smarter than I regarding such matters. I look forward to the resolution. On second thought, pictures are SO SLOW to upload to the app and then to attach to the invoice. I get dizzy watching the spinning indicator on the screen. When our customers book a call online, the app treats them as brand new customers. That is detrimental when we need history to know what we’ve done in the past and who has done the previous work. HousecallPro has changed the way we do business. Our customers appreciate the scheduling and on-my-way reminders, our staff loves the ability to store photos, notes, multiple addresses, etc for easy reference. Integrated instapay means money hits our account faster. The ability to run reports on virtually anything gives us great information on everything from our best selling services to our best performing employees. The staff at HousecallPro is exceptional. They are knowledgeable, helpful and professional in all they do. They care about their customers and it shows. Can’t say enough good things! I don’t have an option to receive notifications. So glad I was turned on to HCP. It has helped our business exponentially. 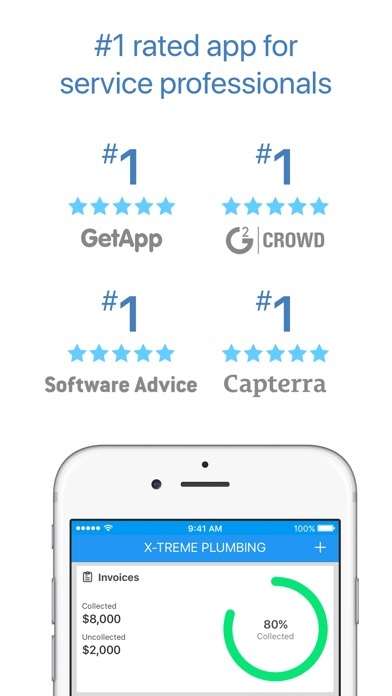 Love, love, love HouseCall Pro. How can I out into words what this company has done for my company. They literally handle everything for your business. Even got me hooked up with fundbox solely because they organized all my transactions for me enough to show lenders I’m worth it. There should be a 10 stars! This organization is the best for your company. Everyone is different so they allow you your freedom on how to organize and customize everything. Love love that they send texts and email to my customers for me. I really look like and feel like a Pro. House call is the best. I have over a decade marketing small businesses. My boss uploads documents to a particular job. They are available to view/download when I am accessing by my laptop. When I go to view on my Android, the documents are not there, “sometimes.” Same goes for my iPad. Not consistent and not addressed anywhere. Their is endless things capable of accomplishing with this app! I have used excel for years for invoices, but this in my opinion blows it out of the water!! Great job guys. Hate the new colors. Very blah and feel like it’s gone backwards. I think it’s time the design team can make the Ap feel more rounded and streamlined. Needs some splashes of color. Easier options to schedule with less clicking. Best scheduling Ap but I feel like it needs more refinement. Still lots of clicking to get something finished. Still feels analog. I wish it looked like Monday.com or similar. It can look nice and be easy to use. Still the best scheduling Ap on the market though. Using the app as an employee currently trying to set up my account. Didn’t have any trouble logging into my account but there is currently not an option for adding a profile picture, there is only an option to edit background image. This is the best software for my company. I do HVAC and this has brought my company into the future. Love everything about this company. Technical support is amazing. Thank you House Call Pro.. I have dealt with many information systems and this one is fantastic. I work in the office and this thing does everything. I highly recommend using this for your business or to find competent help for whatever you may need. It’s hard to believe that this software is responsible for changing my whole business, but it has. I can’t imagine doing business without it now. Only works in portrait mode on iPads! I was excited about Housecall Pro until I downloaded it on my iPad. My field techs all use iPads. I use an iPad during my frequent business travel. But HCP’s app only works in portrait mode, not landscape mode. That makes my keyboard case useless, which means I’m not going to be scheduling jobs or doing anything else in HCP on my iPad. PLEASE release an iPad version of your app! HCP streamlines a lot of paperwork and customer information. The newly integrated Service plans feature is great. I wish they had a place to store customer equipment information other than in the “customer notes”. I have referred to a friend with a landscaping company and another with a pressure washing company. Super easy app/System to use, keeps you lined up with what needs to be done to be sure nobody gets forgotten. I will recommend Housecall pro to all my home services friends. We have an HVAC company and love HCP. Haven’t filled out a paper invoice for over a year. It works great for me. 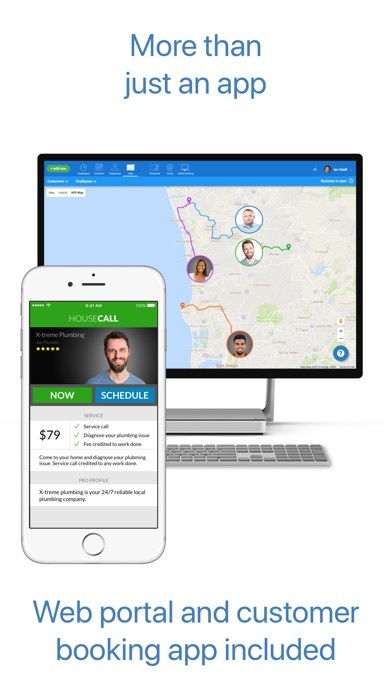 I have sent a lot of business to house call pro because I’m sold. Minor problems that I’ve ran into, pictures do take a lot of time to load. Mobile version could use some work. Housecall pro is very easy to use and is friendly to both office staff and service technicians. You can upload price lists easily. It makes dealing with paperwork easier. I am new to HCP and so far I love it. There are a few features I would appreciate though. A separate iPad app that supports Landscape Mode would be great. Since it is currently tailored for the iPhone, on the iPad everything looks blown up and somewhat distorted. The abilities to manage the business in the field and on the road works best for me using the website on the iPad due to more flexibility. There has been some growing pains associated with migration to using HCP from other software, but overall the customer support alone makes it very much worth every penny. Perfect for The Flying Wrench! Easy to use and a fantastic app! I use this app all day every day and it’s so great for keeping track of jobs employees and scheduling. Please make a landscape version for the iPad. The app is good with the exception that it would be easier to type if there was a landscape version for the iPad. The app does not take up the full screen of the iPad and it makes the keyboard small and difficult to type reports on the job. Our team really enjoy using this app it’s very helpful. The Zillow info helps tremendously. 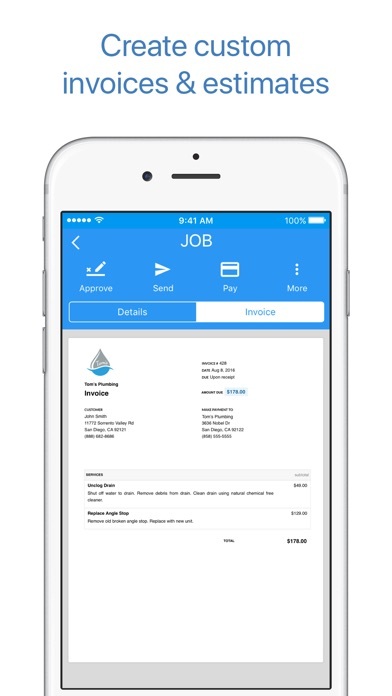 Easy to track invoices. Great Features. Would love if you guys put a back button in the app. If you accidentally try to add someone to the community you can’t press back only “cancel Button which erases what has been inputed into the invoice or estimate. . Thanks. So far everything is going well and is easy to setup. Absolute Awesome App! Customer service is better than I’ve ever experienced with an App or Software company!! Easy to use, great software. Thanks to Housecall Pro, I love it, easy to use and Very professional. This app has brought us into the 21st century as a company! Our customers love that we are now paperless, and our office has less paperwork = win win!! Everything is ok, but it’s big minus that employee can’t get access to his account through the web. Through app only. HCP as a provider is amazing... the app not so much. The mobile app loses so much functionality for the admin/owner that is available on a PC. 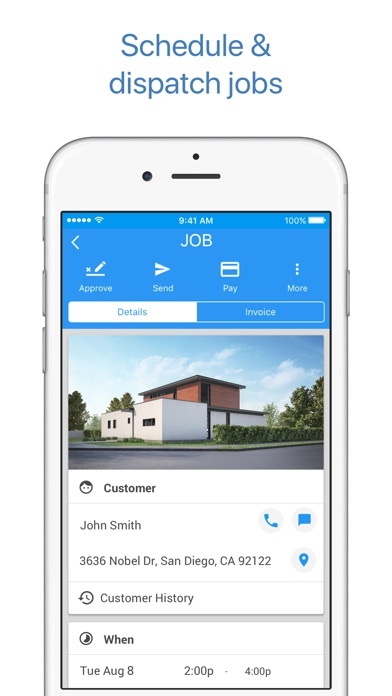 If you require the software HouseCall Pro offers there is an extremely good chance you’re ALWAYS on the go. Losing touch with about half of the features because you’re out and about doing the jobs that require HCP to begin with is like drying off with a soaking wet towel. There are so many functions, in my opinion, that need to be available on the mobile version for admin/owner— Keep in mind I have only been migrating over to HCP from HomeBase and other softwares for less than a week so I likely haven’t even discovered every tool yet. There’s still enough missing on the mobile version that has me teetering on the fence about continuing to use it.... especially for how expensive it is. $179/month just so my whopping 2 employees can clock in/out when they arrive at a clients home? A couple ideas that would increase the value of HCP are listed below.. hopefully maybe they’ll come to fruition. 1) the ability to assign an employee’s shift to a particular job. I have a cleaning company and girls that clean several homes in one day. I want to be able to assign labor hours to a job and upon completion/invoice payment see how much was paid to ya vs what I have to pay in payroll. Why not have this feature considering all of the other elements already exists. 2) It would be cool to be able to make group chats where you can mismatch employees depending on who their teamed up with that day. It would cut out a lot of copy paste communication. I want to be able to speak to a team as a team when we aren’t a together. I will update my review as updates happen.